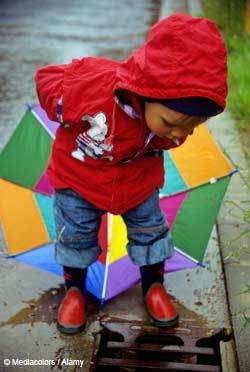 Keep a supply of rainy-day clothes readily available so that adults and children can go out whatever the weather. A sudden downpour is an exciting opportunity to build a shelter, stand under umbrellas, stamp in puddles or collect rainwater in containers for a measuring activity. Encourage independence by organising your transition area well, teaching the children how to put on their coats and wellingtons, and how to keep them organised on pegs and in baskets. Create a photographic display at child height to prompt the children to consider what extra clothes they need. Provide a non-slip mat to reduce mud and grass being brought indoors. Help the children to learn about how precious water is and how important it is not to waste water. Waterproof clothing; wellingtons; umbrellas; hats; pop-up tents; plastic sheeting; selection of materials that sink or float; guttering and downpipes (available from builders’ yards or DIY stores); washing-up liquid and food colouring to create colourful ‘bubble puddles’; decorator’s brushes; paint rollers; different-shaped containers for collecting and measuring rainfall; unbreakable mirror to watch the raindrops land on; story books and nursery rhymes about rain to share under a big umbrella or in a tent while it is raining.